Whoa…I always thought there was something a bit off about the look of John McCain, and now I know what it is. In official breaking news, I’ve discovered (with help from Literal Barrage) that John McCain is a Cylon. Don’t believe me? 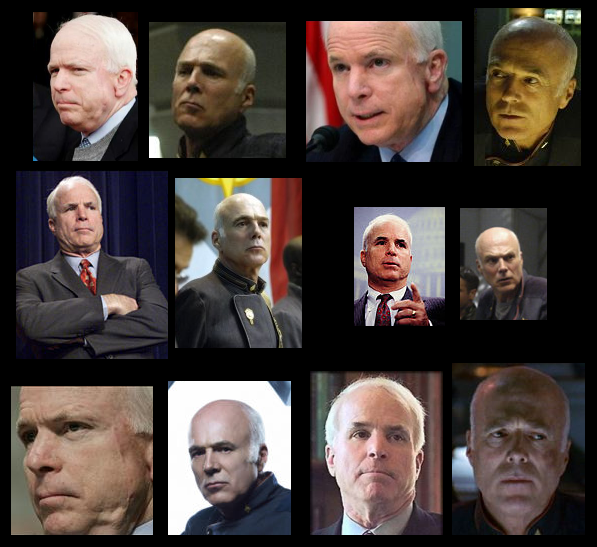 Check out the crazy resemblance John McCain has to Colonel Tigh, who I’m sure will be revealed as a Cylon in the final season of Battlestar Galactica, set to premiere in March. What have you done New Hampshire! We might have a Cylon in office now! Thanks to the Metamerist for the pictures. You and I both had the same idea (see my version at http://freeformfresno.blogspot.com). But it turns out another Blogger, “NerdMom,” is trying to steal your idea and pass it off as her own. She did the same to me yesterday, and after I asked her to alter her post to give better credit, she instead stole your image and shifted a really poor “hat tip” from me to you. Thanks for the heads up Farris. I just wanted to clarify that I did not create the image above but did credit the site that did. I’ll still let nerdmom know to credit the right site for the image. Thanks again. It’s really shocking how similar McCain and Colonel Tigh look. I just came across your post because we were just watching BSG, and thought the same thing! I did a search on “John Mccain Colonel Tigh” and found this. Amazing resemblance! Thanks for stopping by Nate. Now, the questions is, who’d make a better president, John McCain or Colonel Tigh? McCain has the advantage of being from the U.S. and having fought for this country, while Tigh trumps McCain’s war experience and has the benefit of possibly being a super advanced robot that would surely surpass our own intelligence. I wouldn’t vote for either of them but if it came down to these two…frack it, let’s risk it with Tigh. I’ve known it for years. Those chipmunk jowls of his? Those work like dolphin heads. They’re sound transducers so he can navigate in the dark. That’s how he’s able to walk around despite the fact his eyes have been closed to reality for decades. Answer, neither as one is born in Panama and the other is a Canadian. That said, Tigh is awesome and I would far prefer to be rules by him. Welcome farkers (people from fark.com)! Thanks for making this an even better day than it already was (with my Celtics winning last night). I agree rend, Tigh would for sure be better, at least he learned from Adama. Someone get the WAAAAAAAHambulance, someone copied something out on the internets. Geesh. Wow. Literal Barrage pulled a Ric Romero. Don’t forget to post the “Who the frak jarked off in my coffeeeeee?” pic while you’re at it. omg he’s a Silon lol. Seriously they both have that military look don’t they? Yeah they do Sid. All I know is, for the sake of everyone, I hope Col. Tigh / John McCain is not the next U.S. president. And has anyone noticed that the new VP pick for McCain looks almost exactly like Mary McDonnell? Yes, BSG was already way too accurate and realistic in depicting and analyzing the problems we face and now it’s predicting presidential candidates. It’s getting a bit out of hand. Tigh cartoon on top as of today. You might have to scroll down later. that’s hilarious!!! Too effing funny!